London is one of the places one can visit at any time and be sure to come back with a head full of images and sounds. So lets cross the Channel and discover the emerging artistic practices that combine media and technology. I remembered while in the tube that took me from Saint-Pancras station to Blackfriars, of Bernard Blistene telling us at the Fresnoy that the Turbine Hall is “the most difficult of all museum spaces to invest for an artist”. So I took myself over to the Tate Modern to meet with a few curators about the celebrated “Unilever Series”. The former machine room of the abandoned power station that became the Tate Modern is particularly impressive because of its size. And it is perhaps to address this space that the Danish Olafur Eliasson decided to virtually push back its limits in 2003, by covering the ceiling with a reflective surface. This fourth intervention by the artist financed by the Unilever group is entitled “The Weather Project”. 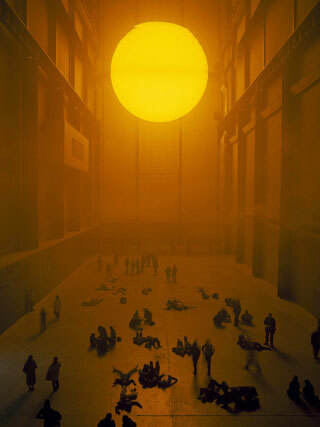 By being reflected on the ceiling, the semi-circular disc composed of hundreds of lamps diffusing the same yellow light takes on the allure of the setting sun whilst at the same time, the mist created by atomisers gives the impression of a rising sun. But it’s all just an illusion. Nevertheless there are lots of visitors who come back to sprawl on the floor, yearning to see themselves in the mirror above. The artist meanwhile is participating in the tradition of trying to seize the special moments that mark the beginning and the end of the day by simply representing the sun. 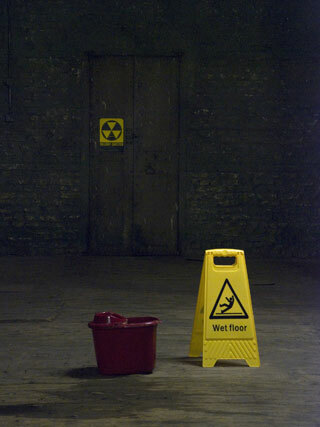 Bruce Nauman took possession of the Turbine Hall in 2004. His installation involved sound recordings of earlier video creations broadcast through various loud speakers placed around the space. Emma Dexter, the curator of “Raw Materials”, uses the term “oral collage” to define this assemblage of voices. An adult ceaselessly repeats “Thank You Thank You Thank You”, at the entrance to the museum before their voice mixes with that of a child a little farther up saying, “You may not want to be here. You may want to be here. You want to be here”. The first recording dates from 1992 while the second is borrowed from a work entitled “First Poem Piece” from 1968. But this is not a retrospective because only the sound tracks from earlier works, like so many raw materials, participate in redefining the interior space of Turbine Hall. As for the notion of recycling that is inherent in this fifth episode of the Unilever series, it resounds most fully with the title of the inaugural piece in 2000 of this same series by Louise Bourgeois: “I do, I undo, I redo”. There is another landmark sound installation dating from 2006: a piece by Bill Fontana entitled “Harmonic Bridge”. The American artist transforms Turbine Hall into an immense resonance chamber by broadcasting the sounds coming from the Millennium Bridge that crosses the Thames close to the museum. 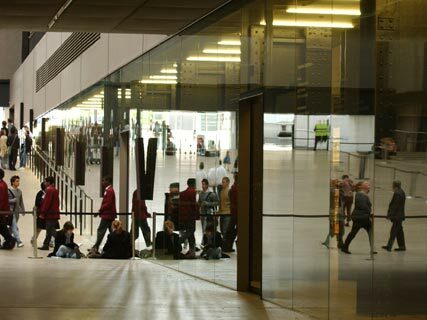 The vibrations that are created by groups of people walking across it, or by the wind or by boats, are transformed by accelerometers, placed at various points along the bridge, into sound waves that can be heard through loud speakers in Turbine Hall. 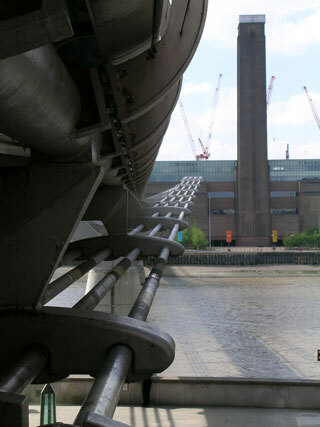 By placing sensors on the cables that comprise the framework of the Millennium Bridge, Bill Fontana thus converts it into a string instrument whose rather “industrial” musicality can still be heard today through the use of an application on the Tate Online site. We should point out that another application, on the same site, offers a simulation of Bruce Nauman’s “Raw Materials” sound installation. I went at nightfall to Trafalgar Square to “awake a few sleepers” because Rafael Lozano-Hemmer had taken over the square for a few nights with his installation “Under Scan”. 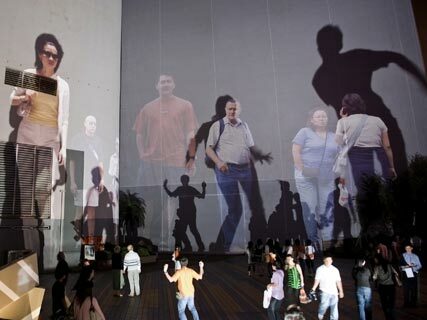 Human scale images of people appearing to sleep are projected on the ground on the trajectories of the passers-by, who by superimposing their shadows, awake the sleepers. Some of these figures wave to us, others gesticulate or play out other situations, but all of them stare at us and then disappear when we lose interest in them. The spectators interact very naturally with the images. So games begin. Some kick at them with their feet, others exclaim, jump or run. This kind of installation is only interesting when the public takes it over. And here, even the filmed actors took over the work-to-be earlier on, because the artist gave them only one instruction: to look at the camera. So the spectacle initiated by the artist and played out by the passers-by, in reality, seems to follow the sleepers that are being wakened in the image. 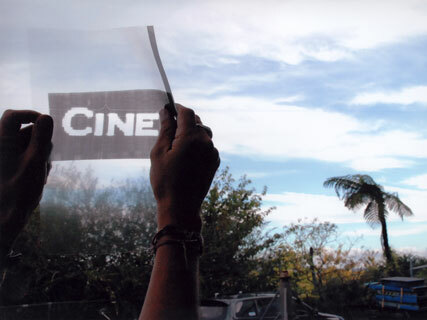 The ICA is among the partners who came together to organise Rafael Lozano-Hemmer’s intervention in the public space and to take advantage of the occasion to organise a retrospective for him, during which he was invited to give a conference. This Canadian artist of Mexican origin presented some of his earlier installations like his 2001 piece entitled “Body Movies” there. It invokes the artist’s inspirations by notably citing an engraving entitled "The Shadow Dance", dating from 1675 and signed by Samuel van Hoogstraten, where we see actors playing with their shadows because the installation “Body Movies” uses powerful light sources associated with video projectors. 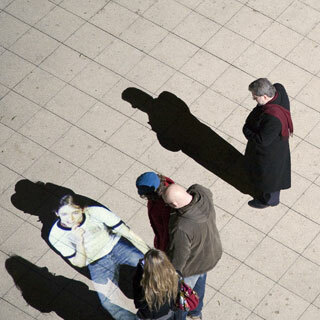 We see in the video sequence documenting the installation commissioned by the V2 Institute of Rotterdam, that the passers-by also play with their shadows. Their silhouettes are tracked by a system that automatically projects images of people onto them from a database that most closely matches them. The spectators then voluntarily modify their positions to better fit with the image of their shadows. But the artist also enjoys explaining how these pieces are sometimes distorted by the public when a young woman, for example, having asked her boyfriend to move closer to a wall, “mistreats” his tiny shadow with her enormous one. There are other spectators who, during this time are picking up the radio waves in which the Barbican Centre is immersed. And again, it is through their projected shadows that they can listen to various radio stations ranging from emergency frequencies to music stations by moving along the curved space of the art centre that has been appropriately named “The Curve”, using their shadows to turn up the volume as they increase in size. Naturally, this installation dating from 2003 is called “Frequency and Volume”. 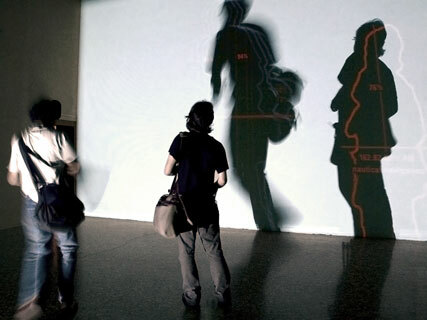 The use of shadows and silhouettes is recurrent in Rafael Lozano-Hemmer’s work, but he points out that he is not the only one fascinated by their shapes and shows us at the end of his intervention the research of other artists he is close to like Minim++, Jim Campbell, or Golan Levin. Some of Rafael Lozano-Hemmer’s installations have been redeveloped by the artist in the form of transportable devices that comprise a series entitled ”Shadow Box” begun in 2006 with a declension of “Under Scan” that was renamed “Eye Contact” for the occasion. 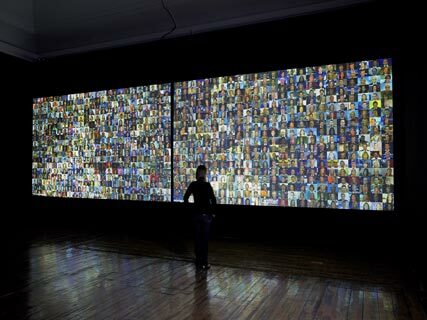 The public, in this case faces a screen showing a mosaic combining 800 images of the same people lying down. And they only get up to stare at the spectator when the spectator’s outline, captured in real time via an integrated video camera, covers them. Inversely, there are works that have been conceived by the artist in “Shadow Box” that end up in the form of installations. This is the case with “Shadow Box # 6: Reporters with Borders” from 2007, which became the installation “Reporters With Borders” exhibited in the London gallery, Haunch of Venison. And as in painting, the size changes everything from our perception to our physical relationship with the work. The images that compose the two large video mosaics being projected represent news journalists from televised news programmes. Every five minutes, they are redistributed to the left or the right based on criteria such as Mexico and the United States, man or woman or light or dark skinned. But the members of the public are beyond frontiers because it is with the outlines of their own bodies in crossing the lines of what too often separates us that they trigger the multitudes of video sequences. Not far from Haunch of Venison Gallery, there is another gallery whose programming is just as pertinent. It is called the White Cube Gallery and it is exhibiting the video installation “Sigh” by the English artist Sam Taylor-Wood. Eight large-scale video projections are positioned in an octagon. The BBC orchestra is playing a piece by the composer Anne Dudley. The conductor addresses the percussionists while the string and brass instruments are arranged on either side by group. But the concert hall looks more like a warehouse and the musicians are dressed in their regular clothes and more importantly, are without their instruments. Nevertheless, all of their gestures are exact, even those of waiting and preparing. So we adjust to this absence just like those who are playing their invisible instruments. The absence here, which could not be more flagrant, is by no means experienced as a lack. Another gallery, close to Piccadilly Circus, is exhibiting paintings that were made in a hypnotic state by Matt Mullican. This is the Karsten Schubert Gallery that associates two large-scale works along with video sequences that bear witness to the state of modified conscience the American artist is plunged into during these performances. He is only brought on stage when the public is comfortably seated. He doesn’t know what he is going to do beforehand. His face is nervous, he bustles about and ends up drawing a line on the floor with masking tape as a means of protecting himself from the public! That is part of the ritual that evolves, depending on the performance. The public meanwhile laughs when the artist shouts out insanely, which is another way of protecting himself, from himself. The black on white paintings or drawings are nothing but the results of a process that becomes more important than the works themselves and evokes the automatic writing of the surrealists. 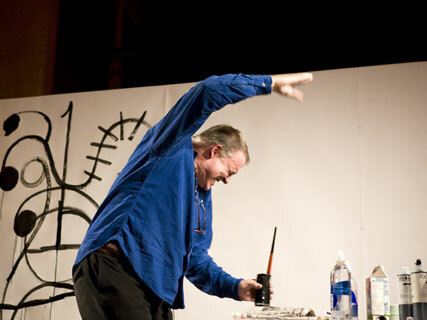 And if you ask Matt Mullican if he is conscious or unconscious during his performances, he will tell you that he is more in a state of hyper conscience. We now leave the centre of London to go towards Liverpool Street where BANG, which stands for British Atomic Nuclear Group, has set up in order to promote nuclear energy. In reality, it is The Arts Catalyst association who specialise in combining art and science that is hiding behind this promotional window display with an exhibition entitled “Nuclear: Art & Radioactivity” bringing together installations by Kypros Kyprianou and Simon Hollington and a film by Chris Oakley. Everything is spelled out by an interactive terminal where the question “Want to know more?” invites the public to push a big red button that doesn’t set anything off. We then enter an abandoned warehouse where everything is just a set up, from the sign that warns of a slippery floor to a pictogram that defines a radioactive zone and from the small office abandoned by the night watchman to the room stocked with white barrels that look in every respect like those that some are quite happy to throw into the sea; from the alarm signal that hums, alternating with the clicks of a Geiger counter; from the flashes of white light we perceive through the glass tiles that make up part of the floor to the coloured lights that ceaselessly blink on and off. The ambiance is oppressive and people feel slightly hysterical. When a woman asks me if I’ve visited a room that seems to be closed, I become doubtful. But I have to admit that radioactivity has haunted my worst nightmares, undoubtedly because they perfectly represent the worst dangers of the invisible. Do you want to know more? Robots created by artists are fascinating for their uselessness and all one needs to do to be convinced of this is to go to Bethnal Green where Space is located whose exhibition “Schematic” once again expresses itself around the relationship between the arts and the sciences. 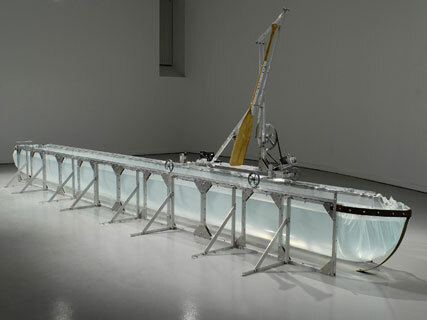 A few robots made by Canadian artists are presented there following the example of “Canoe” conceived by Peter Flemming. It involves a Canoe filled with water whose sides are transparent. Its single paddle, which is controlled by a motor, enables it to move back and forth from the bow to the stern and vice versa. Let’s use as another example “Fair-Weather Forces” by Germaine Koh which appears in the form of a velvet rope whose height is relative, through the Internet, to the level of the sea elsewhere. Lastly, “The Big Job” by Joe McKay is nothing other than a mechanical progress bar in canvas that perfectly evokes the ones that “never” help us wait on our computers. It takes 3 to 4 minutes to arrive at the end, ring a bell and come back to its origin to begin again and again.